Embracing bilingualism helps school achieve Good OFSTED report. What great news that a school in Peterborough has improved so greatly in the past months that OFSTED have now deemed them as good. So remarkable that news papers Peterborough Today and the Daily Mail and even the radio station R2 have today run the story. Readers of this blog will not be surprised that by embracing bilingualism and using it to benefit your teaching improves and speeds up the rate that the pupils learn English. I have gathered information about its benefits and the results are now starting to come through. The head teacher clearly supports this view of bilingualism and her results show that by embracing it results can be improved quickly. I believe this is the start of the educational culture change which so many schools and LA officers were resisting up until a year or so ago. I am also hopeful that this great result will also make sure that gone are the conversations littered with I only have one or two! or what can I do I don’t speak their language? as an excuse is changing. Gone and evidently going are the teachers plodding along teaching what is comfortable for them in such a way that it takes longer than necessary for the children to pick up the language. Children pick up social language quite easily and it is the schools job to ensure the curriculum is taught and academic language is known and understood. In the future we should now be able to say that Every Student does Matter. but by sharing and supporting each other we can ensure that this becomes the reality. Design Technology is a practical subject with elements that require explanation of ideas, development of ideas using a mix of drawing and text, planning and at the end of everything evaluation. These areas are often neglected to be mentioned by senior managers as they often believe that the written element is so small it contributes little to the practical component. However this is not true in the classroom. In the classroom young people often find it difficult to express the ideas in their heads when the classroom language is English and their first language is the same, but put your self in the shoes of an eight or thirteen year old whose first language is not English. It is worth thinking about this at the planning stages what tools, including websites and withdrawal classes for pre teaching support, will you ensure you have to hand to support the child through the learning process? What words will the child need to know to effectively evaluate or predict? How will you ensure that they learn these academic words alongside the other skills and practical language and skills they are learning? What is your plan if some one new is integrated into the class when you have done the groundwork with others? Pupils who are at the emergent, developing and consolidating levels of learning EAL will benefit from planned interventions and structures to ensure they develop the language skills they need to fully access the curriculum and produce work and portfolios at the appropriate level. This cannot be left to chance it must be planned for, including ensuring if words are to be learnt they are learnt in context. Too often classrooms and workshops that I have observed, have words that may appear random to someone with very or little language of the classroom. If you must put up words, use pictures to show the product/concept and a sentence with it in context for the children to use as their starting point. One thing you can do is to recognise the benefits of pupils using their first language at all stages of the design process and also support them to keep the language alive as this supports 2nd language acquisition, increases their self-esteem and can lead to decreased bullying incidents. lovely the symbol for sing in Chinese. I love to sing. 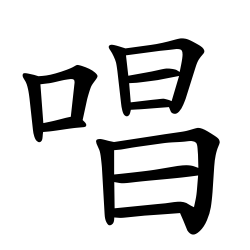 The character 唱（ㄔㄤˋ） means to sing. Here is the stroke order animation and pronunciation. Here are the individual strokes for writing the character. Here is the definition in Taiwanese Mandarin. Here is the evolution of 唱.
OFSTED have set out a set of tools to help support ensuring that your pupil premium is spent effectively and gives guidance for schools to show how its use is closing the gap. Different criteria for secondary and primary it focusses attention on results and the use of the money to improve English, reading, writing and maths. Where are the gaps in Year 11? Where are the gaps (other year groups)? Where are the gaps (other eligible groups)? Where are the gaps (Year 6)? Below is the guidance for Secondary and primary schools re. where to look for the indicators. service children in later section). Data for the pupil outcomes table for Year 6 should be taken from RAISEonline. Data for other year groups should be available from the school’s own tracking of pupils’ attainment and progress. The following is a question raised by OFSTED about the date and indicators you have. extent are gaps closing compared with previous years’ data? If you plan to repeat this activity, what would you change to improve it next time? 1. Have leaders and governors considered research and reports about what works to inform their decisions about how to spend the Pupil Premium? 2. Do governors know how much money is allocated to the school for the Pupil Premium? Is this identified in the school’s budget planning? 3. Is there a clearly understood and shared rationale for how this money is spent and what it should achieve? Is this communicated to all stakeholders including parents? 4. Do governors know how the school spends this money? What improvements has the allocation brought about? How is this measured and reported to governors and parents via the school’s website (a new requirement)? 5. If this funding is combined with other resources, can governors isolate and check on the impact of the funding and ascertain the difference it is making? 6. Do governors know whether leaders and managers are checking that the actions are working and are of suitable quality? 1. Do the school’s improvement/action plans identify whether there are any issues in the performance of pupils who are eligible for the Pupil Premium?  give details of how the resources are to be allocated?  give an overview of the actions to be taken?  give a summary of the expected outcomes?  identify ways of monitoring the effectiveness of these actions as they are ongoing and note who will be responsible for ensuring that this information is passed to governors?  explain what will be evaluated at the end of the action and what measures of success will be applied? 3. Is the leader responsible for this area of the school’s work identified? 4. How do governors keep an ongoing check on these actions and ask pertinent questions about progress ahead of any summary evaluations? 5. Are the progress and outcomes of eligible pupils identified and analysed by the school’s tracking systems? Is this information reported to governors in a way that enables them to see clearly whether the gap in the performance of eligible pupils and other pupils is closing? 2. Do the school’s systems enable governors to have a clear picture of the progress and attainment of pupils who are eligible for the Pupil Premium in all year groups across the school, not just those at the end of key stages? 3. If there are gaps in the attainment of pupils who are eligible for the Pupil Premium and those who are not, are eligible pupils making accelerated progress – are they progressing faster than the expected rate – in order to allow the gaps to close? Even if all pupils make expected progress this will not necessarily make up for previous underperformance. 4. Is the school tracking the attendance, punctuality and behaviour (particularly exclusions) of this group and taking action to address any differences? Overall, will governors know and be able to intervene quickly if outcomes are not improving in the way that they want them to? Hope this helps if you have any ideas to share with others where you have used it successfully please add comments. Every so often, I meet a parent who would like to pass on more than one language to their children. Sometimes they are a single parent, dealing with a home and societal language, sometimes they are a bilingual themselves and want their children to speak both of their languages. So, the question comes up, is it possible for one person to be “in charge” of passing on more than one language? There is no absolute answer, but I lean strongly towards “not a good idea”. While I understand the reasoning behind the desire, the elements for successful bilingualism are hard to achieve with one person and two languages. 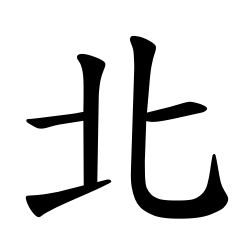 The character 北（ㄅㄟˇ） means north. Here is the stroke order animation and pronunciation. Here are the individual strokes for writing the character. Here is the definition in Taiwanese Mandarin. Here is the evolution of 北. Saw this and tried to reblog but my reader wasn’t working so here it is instead. I thought it was too good to miss. Revision always seems like a mystery and as teachers we never know which advice to give but this does give guidance to start the discussion when the child is on the C/D border what traits can they change to make the grade.